The scores for the tune of Apologize can be previewed further down. 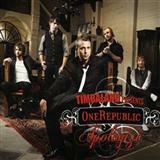 Apologize is a OneRepublic, Timbaland, Deke Sharon composition. Below you can find all our currently available arrangements for Apologize. You can preview any arrangement before purchasing. In order to do this, please navigate to the appropriate score that you would like to see and click on the preview button in that line. We may offer this composition for a number of different instruments. In that case you can choose to only view all available arrangements for one instrument. Do this by changing the instrument in the drop-down menu titled "Instrument". You can easily change this selection again. Leaving customer feedback on a piece or a particular arrangement could not be easier. Just click on the Comments tab, and after selecting a screen name you can post your thoughts on a specific arrangement, or generally on this piece of music. We offer the facility for you to share this song page with the world. If you fancy letting others know how much you enjoyed playing this piece or arrangement then click on the share button on this page and select the appropriate social media which you would like to use. We offer the sheet music for Apologize for 19 instruments. In total our sheet music selection for this song has 31 arrangements to choose from.